A view of the fountain and flower gardens. The central division divides Canada (right) from the USA (left). Rolette County, North Dakota, U.S. The original monument, erected in 1932 and addressed "To God in His Glory", at the front of the park: the border runs through the ball, and continues to between the Peace Tower, seen in the background. The Manitoba flag is seen to the right, behind the Canadian flag. The International Peace Garden is a 3.65-square-mile (9.5 km2) park located adjacent to the International Peace Garden Border Crossing between Canada and the United States, in the state of North Dakota and the province of Manitoba. It was established on July 14, 1932, as a symbol of the peaceful relationship between the two nations. The legend "Peace Garden State" was added to vehicle registration plates of North Dakota in 1956, and adopted by the North Dakota Legislative Assembly in 1957 as the official state nickname. The park plants over 150,000 flowers each year. Main features of the garden include an 18-foot (5.5 m) floral clock display, and fountains. A chime, and twin 120-foot (37 m) concrete towers straddled the border with a peace chapel at their base; the chapel walls were inscribed with notable quotes about peace. However, the concrete towers had been declared unsafe due to irreparable weather-related erosion and were demolished in 2016. The Arma Sifton bells are a chime of 14 bells cast by Gillett & Johnston bellfounders. The bells were a gift from Central United Church of Brandon, Manitoba, in 1972. The tower was supplied by North Dakota Veterans and dedicated in 1976. Some building remains of the World Trade Center attacks of September 11, 2001, have been placed in part of the garden. The Masonic Auditorium, built in the shape of a Masonic Square and Compasses, was completed in 1981 as centennial project of Grand Lodges of Manitoba and North Dakota and features seating for 2,000 people. The Peace Garden Lodge of Freemasons holds an annual communication on the property. The officers, ritual and program are rotated each year between the Grand Lodges of Manitoba, North Dakota, Minnesota, and Saskatchewan. The Peace Garden hosts two youth camps every summer, the International Music Camp and the Legion Athletic Camp. Additionally, it has hosted the International Hamfest, an Amateur Radio meet-up, every year since 1964. Located at the garden is the North American Game Warden Museum. The park lies near the center of the Turtle Mountain plateau, whose climate, topography, wildlife, and natural vegetation differ considerably from the surrounding prairies. The park is located north of Dunseith, North Dakota, at the northern terminus of U.S. Highway 281 in northwestern Rolette County. 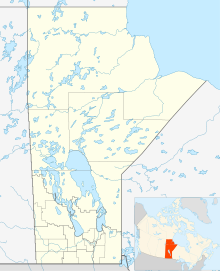 It is also adjacent to the southeast corner of Turtle Mountain Provincial Park in the Municipality of Boissevain – Morton, south of Boissevain, Manitoba, at the southern terminus of Manitoba Provincial Highway 10. There is a $20.00 fee per vehicle. Visitors from either country can enter the park via US 281 or MB 10, without passing through customs, and may move throughout the park (crossing the international boundary at will) without restriction. However, the International Peace Garden Border Crossing stations for Canada and the U.S. are located on the roads just north and south (respectively) of the access drives for the garden, requiring all visitors – including those returning to the country from which they arrived – to go through the immigration procedures of their destination country upon leaving the garden. International Peace Garden Airport is located to the east of the garden on the U.S. side of the border. ^ "International Peace Garden". Https:. Retrieved September 22, 2018. ^ "Page not found - International Peace Garden". International Peace Garden. ^ "Nicknames". nd.gov. North Dakota State Government. Retrieved 9 January 2016. ^ Service, ALLY KRUPINSKY Forum News. "International Peace Garden progress continues as demolition of iconic Tower nears". ^ "Home - International Peace Garden". International Peace Garden. ^ Hanttula, Daniel (2017). The Masonic Tour Guide - Volume 1. p. 57. ISBN 978-1-365-94725-4. ^ "International Hamfest". International Hamfest. ^ "Home - North American Game Warden Museum". North American Game Warden Museum. Wikimedia Commons has media related to International Peace Garden. This page was last edited on 5 March 2019, at 14:16 (UTC).